Fitness tests started in CTC around 2011 when we decided shortlist the strongest members for the trekking in Ombattu gudda, and running 10km in the beach in a stipulated time was the first one. Later, after Peter introduced me to the Pallavaram hill, the next fitness test for the OG mission happened there soon, and it was really helpful as it was a 142m hill with slippery, rocky terrain (typical eastern ghat terrain) which could simulate the whole trekking regime. The most amazing thing is, it is so close to the city, opposite to the airport, that it can be easily accessed for any type of hill training. From that day on, fitness tests happened for shortlisting participants for treks (especially for the moderate ones). After a year, I came to know that Muthu was doing regular hill training exercises out there early morning, and why not make it as regular fitness event like running/ swimming. Hill climbing teaches you lot of things, about agility, strength, stamina and mind control. So we decided to make fitness test as a regular bi-weekly event which was rather conducted as a event for shortlisting. By this way, more people desiring for a healthy active lifestyle could participate and evaluate their fitness and do it as a regular event. There are timing criteria as well, just as a piece of information to improve and work on, but more importantly people started coming regularly on large numbers just to make themselves active. In this way, it not only introduced them to the hilly terrain, but also made them realize about their existing fitness level. Different people have organized fitness events there, but now it is an integral part of CTC. Anyone who is not active for many years, or jumped into city life willing to have a change or fitness freaks or training, everyone is welcome to join the fitness test. It is more of a practice than a test. 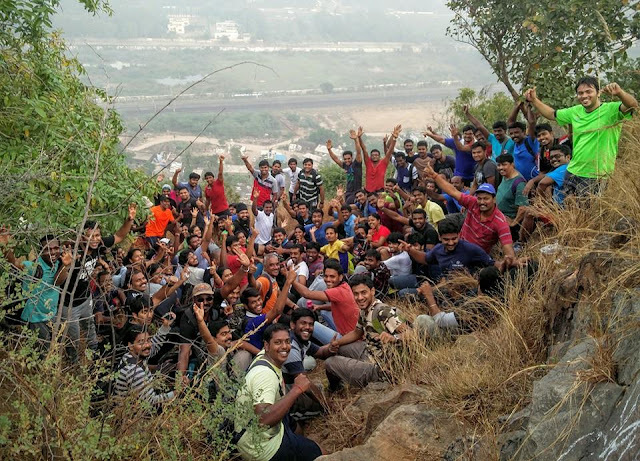 Over the past 6 months, the bi-weekly fitness tests in Chennai trekking Club have played a major role in shaping normal humans into fit individuals, sports enthusiasts into ultra-athletes, budding runners into trail runners. CTC Turns 9 this february, and it is very important to carry on this momentum to continue the fitness revolution that has hit Chennai few years ago. We see triathletes, runners, cyclists, swimmers everyday and everywhere which was not the case few years ago. All this is because of the people's never ending enthusiasm for becoming fit and to be fit and have a healthy lifestyle, regular activity and sport is very important. So do join our CTC's biweekly fitness test to check your level and keep training to improve. There are people who have failed the tests, trained and became into marathoners, so the result is not important whereas the attitude and consistency is. What are you waiting for? Over the past 6 months, the fitness test data of number of registrations per week, attendance per week and fit individual count is given below. This is just the beginning. Others - any regular sport activity will get you quickly in shape: play badminton, volleyball, soccer, etc. We have all become stagnant in our modern day lifestyles (sitting at office, commute, home) disconnected from the active lifestyle of our forefathers. Unless you engage in a regular physical activity to offset our stagnant lifestyle your health will quickly dwindle down. A regular sports routine will make you feel more active & alive, sleep better, eat healthier, you ll make better use of early mornings, ... simply said - it ll change your life! So what are you still waiting for to step out?